The Outreach Permit is intended to provide acknowledgement to the public that the Environmental Health Department is aware of the food donation event and the associated menu and food handling practices should protect public health and safety. The Outreach Permit is valid during the time frame indicated on the permit and is free of charge. Further information about the Outreach Permit may be obtained by contacting the Environmental Health Department at 505-768-2738. Complete the document and bring it to the Environmental Health Department at 1 Civic Plaza NW 87102(map) or fax the document at 768-2698. 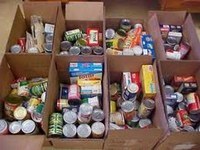 If the temporary event meets the criteria of a food donation event, then an Outreach Permit will be issued. If not, and you would still like to provide food to others, then your application may be reviewed for obtaining a Temporary Food Permit. If you need assistance, call 768-2738. No Fees for an Outreach Permit.